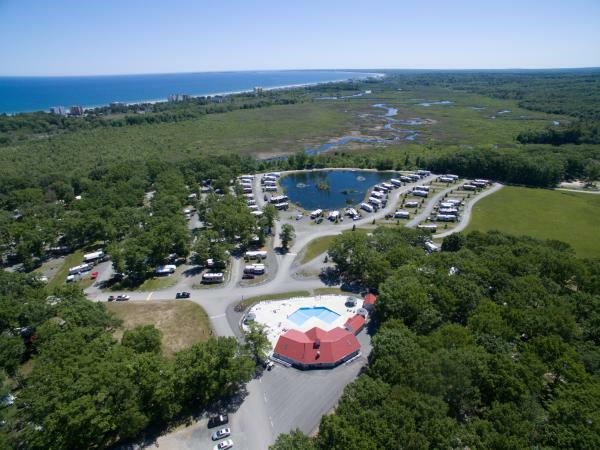 If you are looking for a campground close to the ocean, check out Bayley's Camping Resort on 275 Pine Point Road in Scarborough, Maine. Dubbed "Southern Maine's finest by the Ocean" since 1970, Bayley's is located just a few miles from some of Maine's best beaches and is within walking distance of the beach, making it an ideal spot for the whole family. Bayley's is located six miles from Saco, Maine and offers families 765 campsites to choose from. The sprawling campground welcomes both tents and RVs. Full hookups are available at 650 of Bayley's campsites, with water and electric hookups at an additional 65 sites, leaving 50 sites with no hookups. 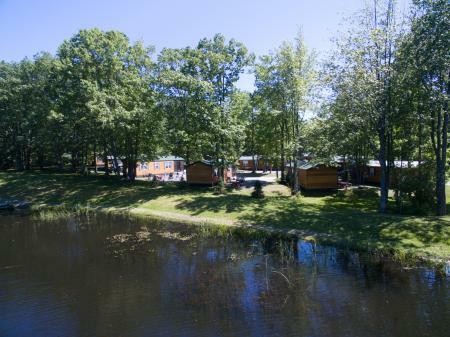 In addition to RV and tent campsites, the resort has a limited number of cabins and trailers for rent. Although the beach is within walking distance, there is an hourly shuttle that takes guests back and forth. There is a wide range of facilities offered by this campground that will keep families busy on and off the beach. Little River Complex built in 2014 is for people 18 and older. This area has a lounge, pool, two hot tubs, bar and grille, and a commercial size laundromat. During the summer, there is live music poolside throughout the week. Complimentary transportation (two shuttles) run on the hour in-season to Pine Point Beach, Old Orchard Beach, and twice a day to Funtown and Splashtown. Three playgrounds are on site for kids. An air-conditioned arcade features video games and a pool table. Three on-site stocked fishing ponds are available. Two well stocked stores provide supplies, and the Seaside Square Cafe serves breakfast, lunch, and dinner. There is a full range of directed campground activities at Bayley's Cove Recreation Center for adults and children from softball and baseball to arts and crafts, scavenger hunts, fishing derbies, mini golf, kayak rentals, adult and teen pool pole plunges, and even a lobster dive. Free in-season family entertainment is provided at the Seaside Square Pavilion and ranges from DJs, bands and hypnotists to magic and comedy shows. A schedule of entertainment is available on the campground's website. Nightly rates depend on the season and on the campsite selected. Senior discounts are available in the spring and fall, but not in the summer. All campers pay a 9% state lodging tax that will be added to all rates. The camping season in 2018 runs from April 27 to October 14. Spring rates (April 27 to June 15) are $45 per night for Bayley South and $40 per night for Bayley North, with a senior rate of $35 per night for 30 amps and $40 for 50 amps. Summer rates (June 17 to September 3) for Bayley's Best range from $78 to $93 nightly and from $549 to $616 weekly. The rates for Bayley's Basic are slightly cheaper, from $71 to $84 nightly and from $497 to $553 weekly. 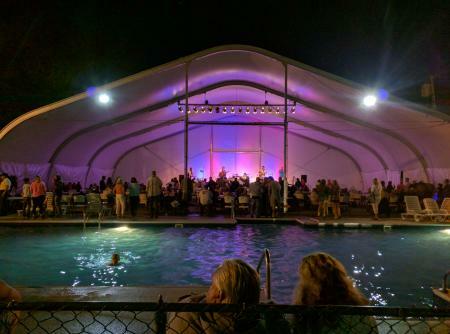 Rates for the tenting area in the summer are $61 nightly from Sunday to Thursday; $66 nightly on Fridays, Saturdays and holidays; and $427 weekly. Fall rates (September 3 to October 14) are $55 per night for Bayley's South and range from $40 to $45 per night for Bayley's North. Special rates apply during Memorial Day weekend, Father's Day weekend, Harvest weekend, and Columbus Day weekend. Rates include two adults, one camping unit and one vehicle with a maximum of six people per site. 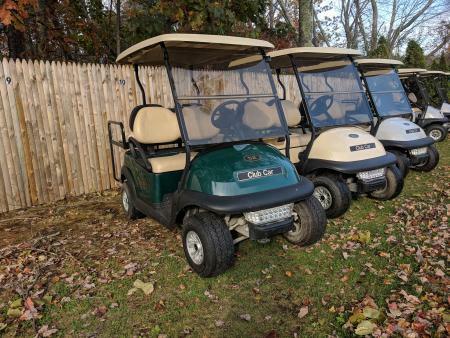 If you are located far from the main activity areas of the park and you don't want to walk, golf carts are available for rent. Campers may not use their personally owned golf cart. The 2018 summer rates for golf carts are $65 a day or $375 for the week. It is recommended that you call the main office for off season rates. Bayley's offers a full range of special packages and deals that start in April and end in October. These deals offer a variety of savings including free passes, deep discounts, and breakfast buffets, as well as a range of activities from car shows to apple picking. Reservations for specials must be made in advance and payment in full must be made at the time of reservation. If you stay consecutive weekends during the off-season, you can leave your unit on site for $10 per week. This includes storage of your unit on the site you have reserved along with keeping your electricity on. When planning your stay, be sure to pay close attention to resort rules and policies, particularly as they pertain to reservations, deposits and payments. Note that reservations of up to four nights must be paid in full, for instance, and cancelled reservations are subject to a fee. Campers must also notify the main office if they are bringing a pet when arriving and checking into the campground. You are limited to no more than three pets and they must be kept on a leash at all times; they are prohibited from the beach and certain areas of the campground. There is a dog park where pets can be walked. More than three-quarters of TripAdvisor reviews rate Bayley's Campground as excellent or very good. On the plus side, most visitors found the park clean and well maintained. They appreciated the fact that there were three pools with one dedicated to adults eighteen and over. It was also noted that the campground offers loads of activities for young and old alike, and that it is dog-friendly. However, some reviews mentioned that some of the most expensive sites don't have Wi-Fi and that although there is a lot to do, it is considered expensive as far as campgrounds go. Visitors also noted that this is a very active campground with many activities going on, so you may want to camp elsewhere if you want a quiet experience. More than half of the members of RV Reviews found that their experience "excellent" or "good," with very few rating it as "poor" or "terrible." Most people noted that the park was well maintained, clean and close to the beach, and it offered tons of family friendly activities. They also appreciated the proximity to the beach, shopping and restaurants. On the downside, price can be a concern and, with all the planned activities and entertainment, it is not suitable for campers looking for a quiet camping experience. It was also noted that not all the roads are paved, resulting in a lot of road dust. Reviewers on Yelp echoed these findings, noting that check-in was easy and that the stores on the grounds of the campground were well stocked, but there were a lot of golf carts on dusty roads and the shuttles to the beach end too early. Whether you are a repeat camper or a first time visitor, it is important to plan ahead to make the most of your time in this family friendly campground. This campground is very large. It is advisable to visit ahead of time to scope out the best locations or to take a tour of the park while staying there to plan your return visit. The older area of the campground offers less privacy and sites are closer together than the newer sections. If you are located far from the main area, you may want to rent a golf cart. Shuttles are free and drivers offer helpful tips on where to go and where to dine outside the campground. Scarborough Beach is within walking distance and Old Orchard Beach is about two miles away. Campfires are allowed, but according to Maine Law, out of state, pine and pallet fire wood is prohibited. The stores at Bayley's Campground sell firewood. If you are under 25, they may deny renting a website to you in order to maintain a family atmosphere. At the same time, if you want a quiet campground or if you are camping without children and want a more mature experience, this campground may not meet your expectations. Some amenities are seasonal, so make sure you check to confirm if the pools and hot tubs are open and if entertainment is offered when planning your stay. There is nothing more iconic than a family camping vacation by the ocean. If you are looking for a getaway that is sure to keep the entire family amused, then Bayley's offers an ideal option. This is a popular family destination in the summer, particularly on holiday summer weekends, so it is best to plan ahead and reserve a great spot in this large and expansive campground.